I‘m a little sad summer is coming to a close… I’m going to miss all my fresh and fruity scents and Yankee had some great ones this year. 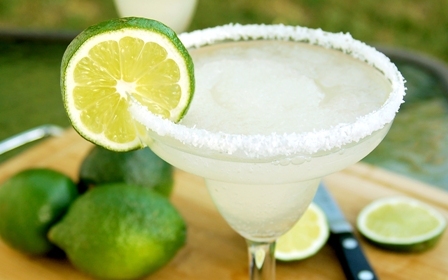 Margarita Time caught my eye the moment I saw it… fresh squeezed lime margaritas… sign me up! And when I smelled it… mmmmmm!! It smelled so good, you want to stick a straw in the wax and drink it! 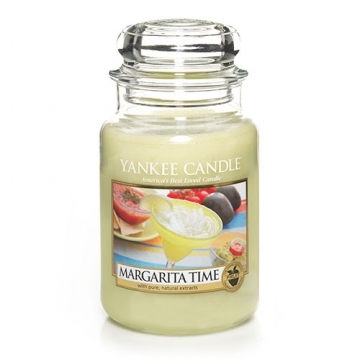 What did my Margarita Time candle look like? My candle was their large classic 22oz jar. The wax color a pretty pale lime green. The label on the candle shows a classic margarita with fresh fruit, guacamole and chips and salsa in the background. I can see why this is a new best seller… it’s such a summery and refreshing scent. As soon as I popped off the lid and smelled the wax, I knew I wanted to buy another one. I’m a citrus girl and this definitely quenched my craving for something tart and tangy. I could distinctly pick up on the lime but I smelled more than just a classic margarita. The picture in the label shows fresh fruit so I’m wondering if there was some type of berries in this scent? I don’t know. As with all Yankee candles… I lit this one in a small bathroom. I don’t even bother trying to burn these candles in bigger rooms. They just don’t perform well for me and it’s not worth the aggravation. Smaller rooms however… they’re perfect. This candle lived up to everything I imagined and although it remained light from beginning to end… it still smelled amazing!! Yummy sweet lime with hints of other goodies I couldn’t quite make out. Whatever it was… it was perfect!! I totally recommend this one for margarita and citrus lovers out there. My candle burned great. Yankee candles burns really slow so it did take a long time to get full melt pools but once it did, the candle burned perfect. No wasted wax. I LOVED Margarita Time. It was the perfect margarita fragrance… sweet and refreshing. There was something about it that called to me. It was a perfect lime… it wasn’t zesty or harsh like some lime scents can be… it was perfect! Keep in mind, this candle was lightly scented for me so should you give this one a try… I would start it in a smaller room to see how it performs and then go from there. I wasn't sure about this one till I took one home. I caught one of their amazing sales and decided to give it a try. So glad I did. I loved it. Even though this is a light fragrance, its still a favorite of mine and I liked it that it's not your average margarita scent. A margarita with a tropical twist. This candle hasn't been around very long and hope they keep in around awhile. It reminds me of a fruit smoothie. I don't think this smells like a margarita but it sure smells sweet and fruity. Very fresh. I will buy again. A fresh citrus with the right amount of sweetness. I love it. Yumma-licious! Super refreshing and brings to mind thoughts of chillaxing on the beach with a cold drink. Love!